You may need to control which fields are available to group on, so that you can use them to create facets in a .NET search interface (see Adding or Customizing a Facet With the .NET Interface Editor). Some fields may contain more than one value for a given indexed document. You can set a field to be a Multi-value Facet to instruct CES to process multiple values independently. Example: The syslanguage field is set to be a Multi-value Facet by default. When a document contains both English and Romanian content, in the Language facet, the document is included in the number of occurrences for both the English and Romanian facet items. If @syslanguage was not set to be a Multi-value Facet, in the Language facet, the document occurrence would appear in the English;Romanian facet item, because the values of the field would be considered inseparable. Note: CES only recognizes field values as independent when they are isolated by a value separator. The default separator (;) is used for all built-in fields. Other repositories such as databases or in-house applications can use different separators—refer to the documentation provided with the repository. In the panel on the left, select the field set containing the field for which you want to control the availability to group on. Select the Facet check box for field that you want to use to group on. 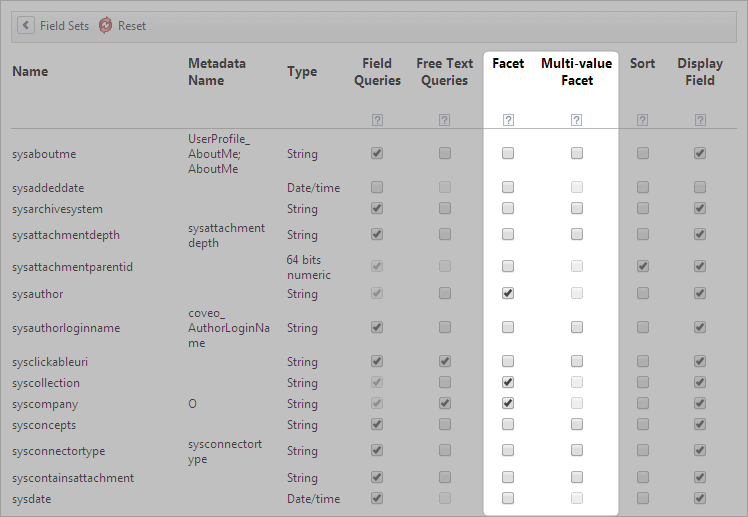 Select the Multi-value Facet check box for fields that CES must considered as containing multiple independent values. CES 7.0.6942– (August 2014) When you make an existing field a facet field, you must rebuild sources that are using a field set containing this field. Using the .NET Interface Editor, create a custom facet using this new facet field to help end-users refine queries in a .NET search interface (see Adding or Customizing a Facet With the .NET Interface Editor).